Maihajja lauded the International Organisation for Migration (IOM) for their efforts at continuing the repatriation exercise even during the festive season. The DG who was represented by the Southwest Coordinator of NEMA, Alhaji Suleiman Yakubu, enjoined the returnees to join hands with various government agencies to tackle the problem of human trafficking in the country. He said they should assist the government in identifying the traffickers who had lured and deceived many young Nigerians to embark on the perilous journey with the promise of taking them to Europe. Maihajja assured them that government would treat all information with utmost confidentiality and secrecy needed. The DG also allayed their fears of facing “spiritual “consequences for exposing these evil persons, stressing that they had a duty to educate the public on what they went through in the volatile North African country. The new returnees arrived the Cargo Wing of the Murtala Muhammed International Airport, Lagos at 6.05pm aboard an Afriqiyah Airbus A330-300 with Registration number 5A-OMR. They comprised 152 adult females, 82 adult males, nine children and 14 infants, with one having a medical case. 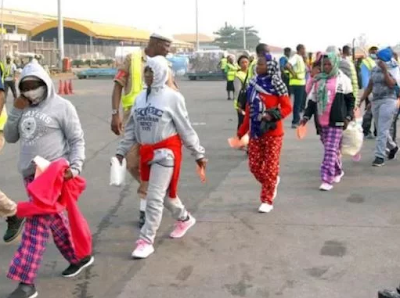 The returnees arrived barely 24 hours after another batch of 157 Nigerians landed in the country from Libya where they had been stranded enroute Europe.